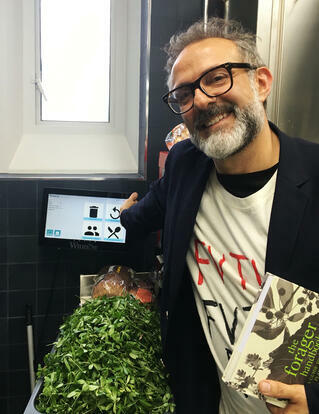 Massimo Bottura, the world’s highest-rated chef opened his community kitchen, the Refettorio Felix yesterday as part of the London Food Month. They serve lunch made from surplus food to vulnerable people. The Felix Project charity supplies the ingredients that would otherwise end up as waste and Bottura teams up with a different British chef every day to produce free or heavily subsidized healthy meals. More than 30 chefs have accepted Massimo Bottura’s invitation to cook at Refettorio Felix. 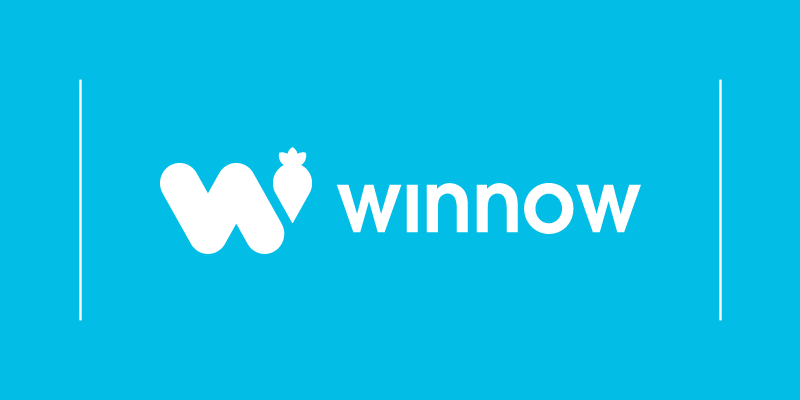 Winnow has teamed up with Food for Soul to help transform the Refettorio Felix into an even more sustainable and unique initiative. The kitchen staff will use the Winnow System to record the wasted items in order to learn exactly how much waste occurred when and where. This gives chefs the information necessary to drive improvements in their production processes to cut food waste in half. We have asked Zoe McIntyre from Food for Soul about the initiative, about its daily operation and about how they promote social awareness on food waste. How has the idea of Food for Soul started? It all started when Massimo was asked to contribute to the Universal Expo held for six months in Milan in 2015. He decided to address the dual problem of food waste and hunger in the city by turning a disused theatre into an alternative soup kitchen. He invited artists to decorate it and well-known chefs to come and cook. The project is still going strong today and was the inspiration for setting up Food for Soul. We went on to replicate the model in Rio, Brazil, Bologna and Modena, in Italy, and now again in London this June. Every project is different, because they are built on the needs of the local community. Massimo Bottura's cooking is as much about the recipe as the experience. How can you marry the two in a soup kitchen? Massimo always says, what’s important is not the quality of the ingredients but the quality of the ideas. This is very much true for our Refettorio projects too. The chefs who will come to cook at Refettorio Felix in London don’t have preconceived recipes to cook from – they must improvise, using their knowledge and be creative with the surplus food that arrives on that specific day. This is what makes the experience at the Refettorio unique – not just for the guests coming to dine, but also the volunteers who serve the dishes and the chefs creating them in the kitchen. Cooking and sharing a meal is a gesture of inclusion. Massimo Bottura emphasized in different interviews that it is not a charity project but a cultural one. How do these kitchens differ from regular “soup kitchens”? The ultimate goal of our Refettorios is not only providing a warm meal. Our idea of nourishment is a holistic one: feed the body and the soul. Our projects have an influence on many different levels. We restore and revitalise underused spaces that become inspiring centres for community use. We bring people together from many different echelons of society; chefs, artisans, volunteers and, of course, guests from vulnerable backgrounds. Food, and the act of sharing meals, is a powerful way to change mindsets – be it related to food waste or breaking down boundaries between cultures. This is what makes us a cultural project. How does the project foster community and cooperation? Our soon-to-open Refettorio Felix is based in a historic drop-in centre called St Cuthbert’s that been helping the local community for the last 25 years. Here, our guests will be served a nutritious, good quality meal that they eat together at communal tables day after day. By asking volunteers to serve directly to the tables, we encourage social exchange between them and the guests – then the chef and the volunteers sit down together to eat after service. After the initial launch, we also hope to use the Refettorio for educational workshops, training and events that the local community can get involved in. Is the soup kitchen business sustainable? Sustainability is a word that gets thrown about a lot these days. What does it really mean? It means that something can be resilient – that it will stand the test of time and be maintained. Our Refettorios are designed to last and as we’ve seen in Rio and Milan that the model survives for the long-term. Where are you getting the ingredients for the soup kitchens? Refettorio Felix is supplied with daily produce including fruit, vegetables, cereals, dairy, herbs and drinks from The Felix Project, a charity working to reduce food waste and food poverty in London. The charity collects surplus food from retailers, wholesalers and producers and delivers it free of charge to over 60 charities across London. The Refettorio Felix is being supplied by surplus from the likes of Sainsbury’s, Marks & Spencer, Natoora, Mash, Hello Fresh and Fortnum and Mason, Whole Foods, Harrods, Paul and Gail's Bakery. What is the process of creating the recipes from excess food? Over the last two years since we started running our projects, it’s been amazing to see how each and every one of the chefs who come and volunteer – and we’ve had more than 200 of them – has brought their own knowledge and culture to life in their dishes, creating something completely original depending on their own style of approach. Our projects illuminate how diversity can enrich experience and creating recipes from excess food enables this to shine through. We have so much admiration for the chefs who come and volunteer their time and energy – it adds a lot of value to what we do. You are working together with many different chefs. What do you think chefs participating at the soup kitchen projects have taken away? In some way, the experience gives them a lot of freedom. There’s no pressure to create Michelin-starred food with tip-top quality ingredients and elaborate recipes – here they go back to basics and rely on their spontaneity to create dishes from what is available. Stripped back to the form, the chefs at the Refettorio are doing what they do best: taking care of people and making sure they are well-fed. The guest chefs also bring their skills, expertise and know-how to share with on-site chefs and apprentices, helping them thinking about food from a different viewpoint. This could be using different techniques, cooking with parts of food usually discard, and using imperfect produce. Do you have any examples chefs have implemented to reduce food waste in their own operations after being part of the soup kitchen project? For some chefs the experience was easy while for others it was something totally new and a real challenge. But for all of them it’s a learning process that shined a light on an way of approaching ‘waste’ ingredients. A good example is that of David Hetz, a Brazilian chef who came to cook at our first project, Refettorio Ambrosiano, in Milan. He was so inspired by his experience he invited Food for Soul to collaborate on a project in Rio. The result was Refettorio Gastromotiva which we opened during the Olympic Games in 2016. Do you ever wonder why more top chefs don’t undertake these projects to combat food waste? There are lots of innovative chefs creating waves in the food world – Jamie Oliver in the UK, Alice Waters in the USA, Matt Orlando from his restaurant Amass in Copenhagen. One of our guest chefs is Douglas McMaster who runs Silo in Brighton – an entirely no-waste restaurant. Times are changing and chefs are realising that they have a lot of potential to influence food culture in a positive way. And this is exciting. You are opening a new Soup Kitchen in London this June. What support do you need? If chefs and volunteers would like to join you, what would be the best way? After our initial launch where a different guest chef is cooking every lunch service, we hope to have one guest chef a month who’ll come and act as a ‘mentor’ for staff. Volunteers are an important part of the service too, helping us make sure the guest are served to the best of our ability. Anyone interested in getting involved can email info@foodforsoul.it. Of course, as a small NGO, we also need financial support, so if anyone wants to dig in their pocket and donate, they can do via our website www.refettoriofelix.com. We appreciated every cent!